4) Summer patterns & Spring fabrics. Get your Easter baskets ready with a cuddly Embroidery Buddy! We have lambs, bears, tigers, and more! Need a unique clock for your sewing room? Rhonda assembled a custom clock for our classroom! We can order more kits...tell us to put you on the list. This clock was sew much fun...maybe we should plan a sew day... I'm Interested! Reserve a kit. 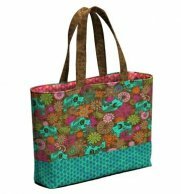 For ages 14-18 - Spend the day making a fun and sassy tote. Student machines will be provided at two students per machine. Shop choice of thread. Of course, you may choose to bring your own machine and thread if the machine is in good working order and you are familiar with it's operation. Bring a lunch. Materials Included: Fabric and supplies included. Class and supplies free with purchase of a Bernette Sew Pink. 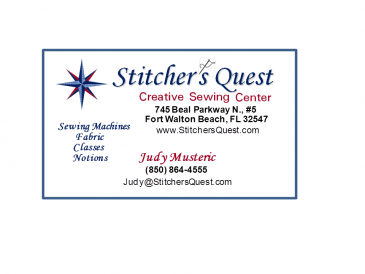 Requirements: Sewing kit - small scissors, seam ripper, pins, 45mm rotary cutter (with safety), 12.5x6.5 quilter's ruler. Master the Half-Square Triangle with the Tucker Trimmer 1. Carolyn will take the mystery out of this versatile technique. Learn how to make this beginner bag with a sophisticated look! Carol Stearns will guide you through steps of assembling this fun tote. Requirements: Sewing Machine in good working order. Contact store for supply list. 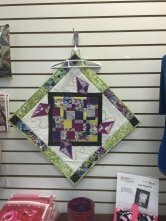 Vickie will demonstrate and lead you through the steps to make personalized greeting cards with your embroidery sewing machine. The designs are also versatile enough for other applications and Vickie is full of ideas to share with you! Requirements: Bring embroidery capable machine, thread, basic sewing tools, and your scrap stash.